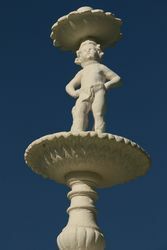 The fountain was erected by the citizens of the Paroo Shire in memory of those who died in service or were killed in action during World War One. It was officially unveiled on ANZAC Day 1927. The fountain was restored and a cannon was placed at the site and unveiled on ANZAC Day 2002. The Memorial Fountain is similar to the one in Cameron Park, Wellington, New South Wales. 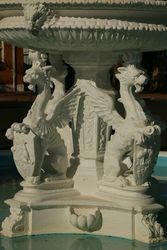 The fountain is in the centre of a wide pool with four tiers rising up. 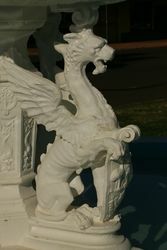 Each tier is supported by detailed masonry, the most elaborate being at the base with four griffins each embossed with an emu, kangaroo and coat of arms. 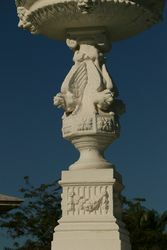 Lion heads support the next tiers, and right at the top stands a cherub balancing the top tier. Members of the Paroo Shire Council and the Diggers Racing Club decided on a novel memorial to fallen soldiers. It is a picturesque fountain on the Five Ways expected to be erected in time for the Diggers Carnival on 11th, 12th & 13th of November 1926. The Brisbane Courier (Qld), 20th September 1926. Cunnamulla Coming Functions.-The Diggers' Racing Club will hold their annual race meeting on July 7 and 8. The Soldiers' Memorial will be officially unveiled on ANZAC Day. This memorial fountain is of a design that is a sister to the fountain in Wellington NSW and is the only one constructed in the world as a war memorial to the Great War expressed in this design. The original memorial was adorned with three World War 1 cannons, however the onset of the Second World War in the Pacific region and the Government`s plans to evacuate that part of Australia north of the "Brisbane Line" the citizens of Cunnamulla buried the cannons in the sandhills that surround the town to ensure that they did not fall inot enemy hands in the event that Australia was invaded by the AXIS forces. With the relief of Australia not being invaded and the war coming to a conclusion, such was the relief that the cannons remain insitu to be lost to eternity. The Paroo Shire Council with the assistance of Hon Bruce Scott MLA, Member for Maranoa have now restored the memorial to it`s former glory complete with cannon and herein again dedicate this to the memory of those who surrendered their youth and their lives in the service of our country such that we may enjoy the freedom that we have today.